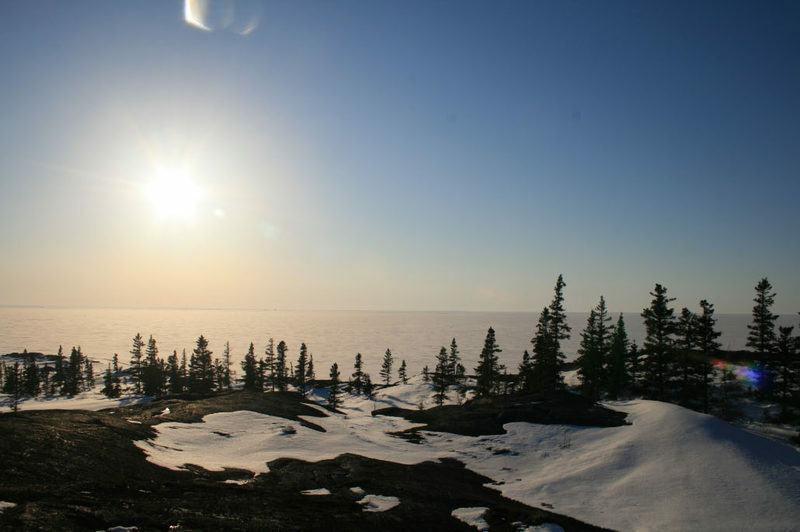 In the far north, the territory of James Bay, north of the 52nd parallel is a vast area to explore, with its Cree (American Indian) communities, with their evocative names: Némasca, Eastmain, Waskaganish. For seven days our dog sledding expedition takes you from island to island on pack ice, encountering seals and the northern lights. We travel, explore and discover an exceptional environment between the ice and the sky. The far north in all of its splendour. A real expedition with complete autonomy. 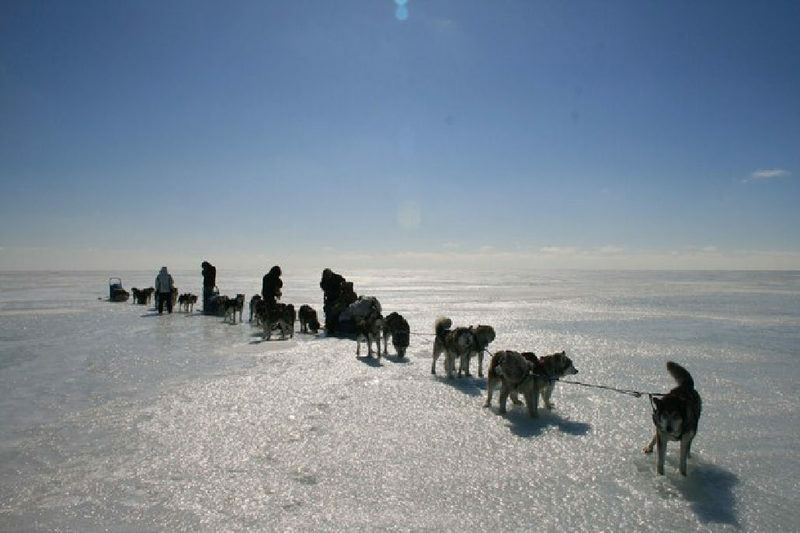 Men and dogs form an interdependent team to explore this vast white expanse. Using a map and a compass to travel around the territory, going to where our desires and encounters with people and animals decide. High probability of encountering caribou, seals, and indigenous Cree hunters. 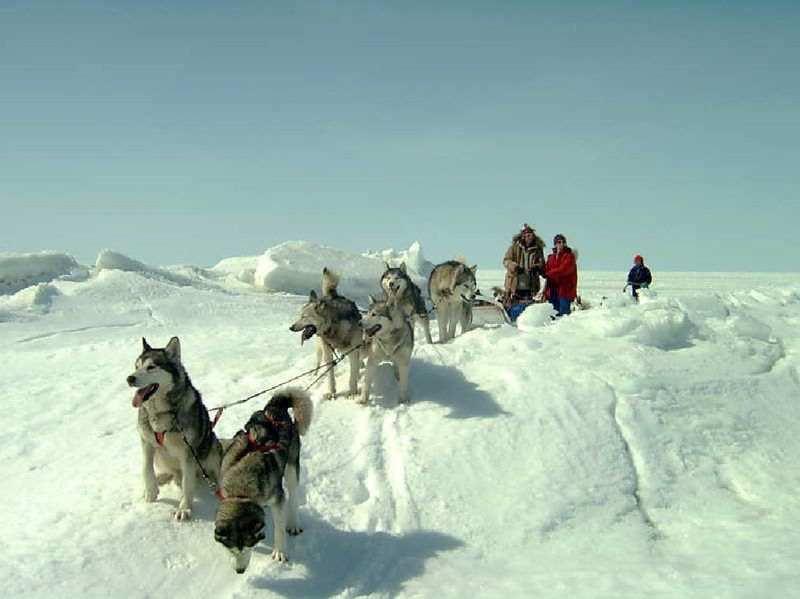 The expedition is open to people who already have some experience of driving a dog sled, as it is not a holiday for learning how to handle a sled and its dogs. To get the most out of your stay, you need to know how to harness the dogs, drive a sled, and have experience of cold winter weather. CLIMATE: Continental sub polar. This expedition takes place in early spring to have the best ice conditions, and warmer temperatures. But the weather can change quickly and a wind on the ice might create difficult conditions. GROUP 4 to 5 people. Nights are spent in tents. Temperatures at this time can still go from -5C to -20C. To ensure the success of this trip, it is therefore essential to have appropriate equipment, and a strong dose of good humor, and be prepared for an outdoor community life (when you have to accept some periods of rudimentary comfort). Difficulties may arise from isolation, weather conditions that may change, camps to mount and the challenges of complete outdoor living with others. This expedition is not for the "faint hearted", but for those who would like a challenging adventure "away from it all". Quebec City, then north to our base passing through the Laurentian Park: first contact with the Canadian wilderness. - A kennel of 70 dogs, malamutes, huskies, Canadian Eskimo. Our different races allow us to tailor the teams to profiles of each participant. Our dogs are part of our team, affectionate and enthusiastic. - Accommodation: chalets nestled in the heart of the woods, with 6 private bedrooms and 3 bathrooms in each cabin, sauna available, relaxation area where you can also view documentaries on wildlife and cultural specificities of Quebec. 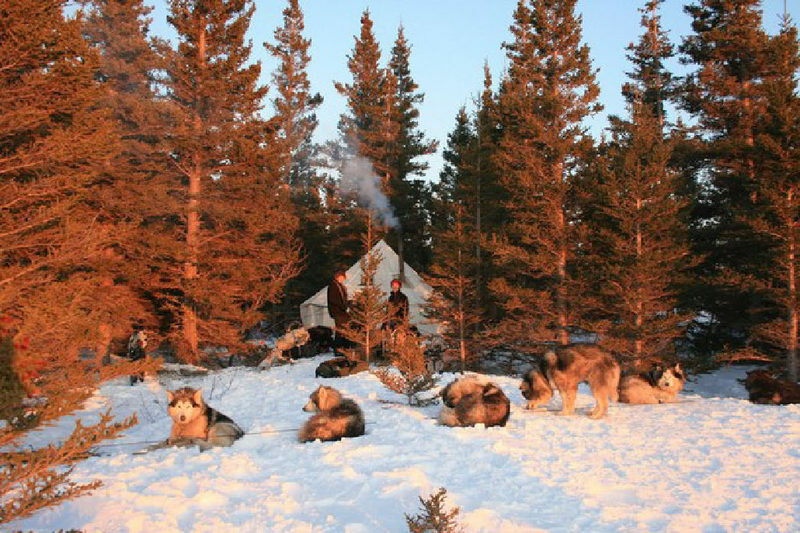 Morning: dogsledding from the base: your first contact with the dogs, your partners for the expedition. Afternoon: preparation and checking of equipment, food, anything that will make us self-sufficient for our expedition. Loading the truck to be ready to go tomorrow morning early.Later, the sleds will carry all of the necessary equipment. This is the great start. We take each dog to its place in the trailer. When everything is in its place, we leave to go north. We pass through the town of Chibougamau to arrive on the "the northern route": 400km of dirt road that will take us to the road to James Bay. Along the way in we obtain supplies from the Cree Nemaska community. 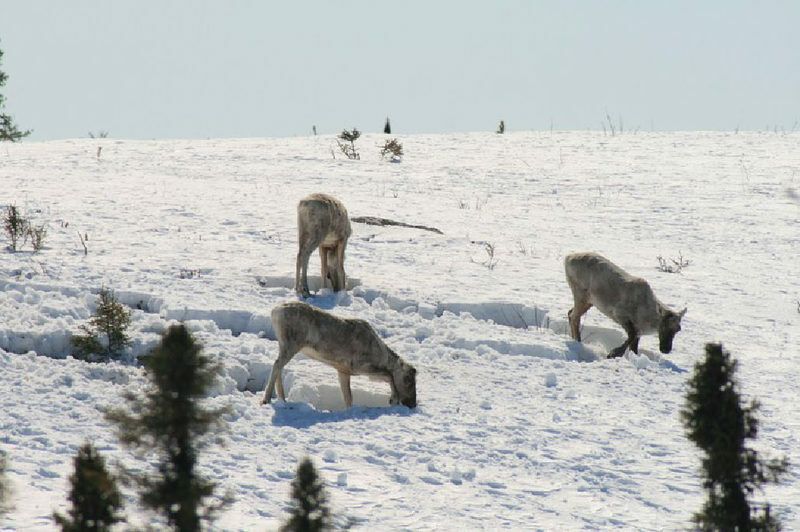 During this first part of the journey, we may be have the chance to meet caribou. Later we camp near the forest road, in the heart of the forest. However, before we can rest, we must settle the dogs for the night: the adventure begins! Continue on the road to reach the road to James Bay, and join the Crees of Eastmain village, on the banks of the river with the same name. This is the opportunity to meet the Crees of this town . The river is our front door to get to the ice. The dogs are pleased and excited to leave the trailer, as the sleds are loaded, and they are harnessed ready to depart on the expedition. Once on the ice we find an island (land) to install our first camp. 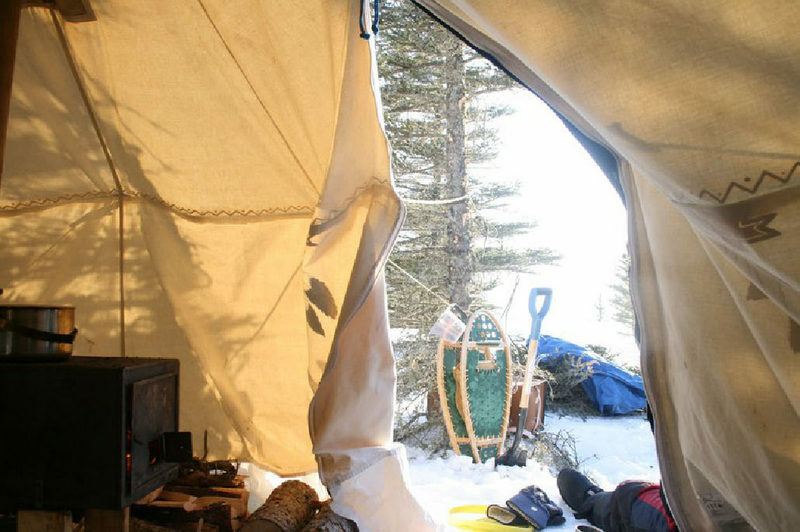 We spend the night in a tent with a wood burning stove to have a comfortable first night. Completely autonomous expedition to explore the sea ice and its islands with dogsleds. Two people per dogsled to facilitate all technical aspects (coupling, uncoupling etc.) that leaves more time to soak in and enjoy everything around us. After having hearty breakfast, and dismantling the camp, we depart to settle further on. 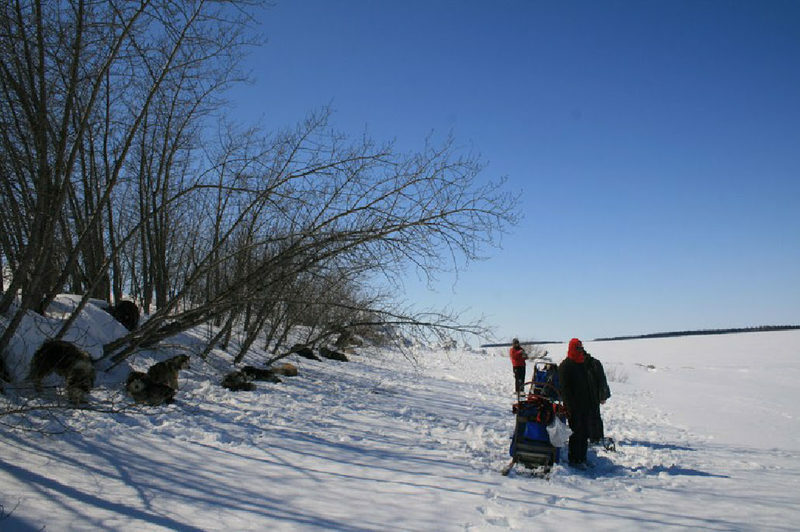 Other times, we leave the camp intact, and, with our 4-legged friends, we explore in more detail the pack ice, and the many islands, as we go searching for seals that bask in the spring sunshine; or take the time to talk to the Cree trappers, who are usually, at this time, preparing for their spring hunting. It all depends on the weather and especially our desires. We are here to enjoy every moment in the heart of the pack ice. Each day we need to start early in the morning to take advantage of the best snow conditions. The evening is spent under the tent, around the stove, or outside watching the northern lights, and preparing for the next day. End of the expedition back at the village of Eastmain. In the afternoon we return to our vehicle to begin the return journey. But this is not the end of the adventure. The goal is to reach the edge of the Rupert River to establish our last camp. Back at our base in the afternoon. The dogs are takent to their kennels. Last night at the base in a chalet in the forest. This is an opportunity to take a sauna, go to see the wolves on our base, or just relax. After breakfast. Transfer to Quebec. If you do not want to take advantage of our shuttle service from and to Quebec City, and come directly to our base, there will be a reduction of $175.00.There is a bus service from Montreal and Quebec to Albanel (the closest stop to our base-25 km) where we will pick you up, and take you back free. Transfers from and to Quebec city and our Base. Supervision by a professional musher guide. Accommodation in a chalet and tent. Rackets for walking on the snow. Meals during transfers Quebec - Base (Day 1 evening) and Base - Quebec (Day 13 noon).